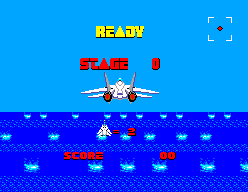 To have access to two continues until Stage 7, press + + during the Game Over screen. To have access to unlimited continues until Stage 17 using the same command above, press x100 during the opening screen before starting the game. Bank your aircraft as far to the left as possible. Hold the D-pad in this position and you cannot be hit until the 12th stage. Line up with the refueling plane when it appears. Use the D-pad to move across the top of the plane, then press + + to refuel.